Clarence lives on a dairy farm with too many cats and not enough food, so one day he hitches a ride to the big city of London to search for a better life. After spending the summer in the park happily licking up ice cream puddles, he must find a home when the weather turns cold. Unfortunately every shop he sees already has a cat on the job, catching mice and guarding its territory. Growing ever colder and hungrier he explores the city, until he wanders into the post office, which happens to be plagued with mice and rats. 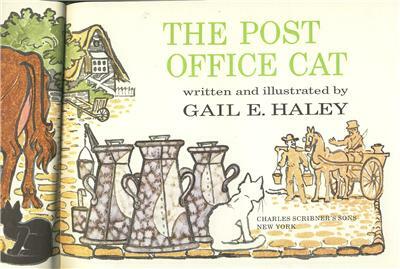 The Postmaster suddenly exclaims “What we need is a CAT!” and Clarence jumps up on his desk. He is hired on the spot. Clarence is given a special collar with a medal inscribed “H.M.P.O.C.” (Her Majesty’s Post Office Cat), and is paid sixpence a week for milk plus all the mice he can catch. 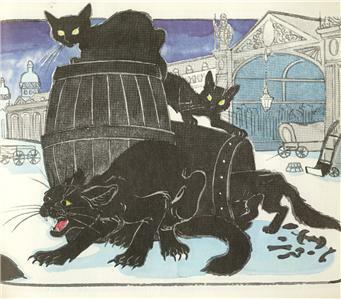 Haley tells Clarence’s story with gently lyrical watercolours, painting a fascinating, cat’s-eye view of Victorian London. 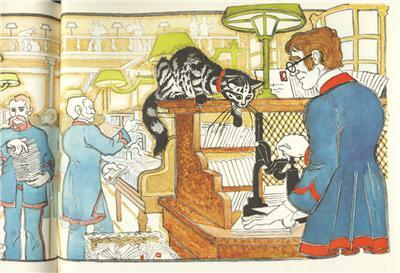 And it’s based on fact – a historical note at the end of the book tells us that beginning in 1868 cats were officially hired at all post offices in Great Britain, a practice which continues to the present day. A charming bit of history, and Clarence’s exploration of the city shows various sides of London society, from fishermen at the docks to the shopkeepers to an upper class household to the homeless poor.